D.F. GOLDSMITH CHEMICAL & METAL CORPORATION inherits a tradition of centuries of involvement with precious metals. The company, currently headquartered at 909 Pitner Avenue in Evanston, Illinois, is the result of over 150 years of family history in precious metals. Records indicate that a man named Solomon Goldsmith lived in Feldskirchen, Bavaria before 1800. He was probably, as his name indicated, a worker in gold and silver. His family immigrated to America in the mid 1800s and settled in Lexington, Kentucky. Solomon Goldsmith's son Marcus apparently continued the family tradition on a limited scale by operating a precious metal furnace in his backyard in Lexington. Over a period of time he threw broken crucibles, slag, and similar materials into a haphazard pile against his barn. In 1867, he shipped this accumulation to a smelter in the East and received a check in return for $15,000 - a truly princely sum by 1867 standards! 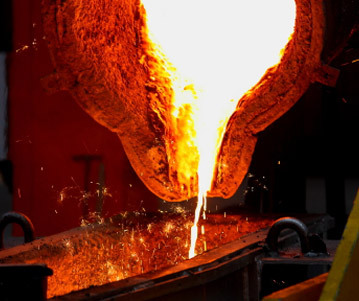 Figuring that any industry which could yield such bountiful by-products had a great potential, Marcus invested his new fortune and his full energy to refining and fabricating precious metals. His sons, Moses and Simon, incorporated the business as Goldsmith Brothers Smelting & Refining Company and moved to Chicago in the 1880s. After 92 years in the precious metal business, Goldsmith Brothers Smelting & Refining Company merged with NL Industries in 1959. The following year Donald F. Goldsmith, the last member of the family still active in the business, resigned from the merged company and founded D.F. Goldsmith Chemical & Metal Corporation. D.F. Goldsmith Chemical & Metal Corporation (DFG) opened in Chicago in 1960 with facilities to produce gold salts and to refine and bottle mercury. The company now is located in its own 5000-square-foot headquarters building in suburban Evanston, Illinois. In 2000, DFG acquired Pool Products Packaging Corporation. Our Pool Products division manufactures, sells, and distributes “Algaedyn”, a Silver based Algaecide for swimming pools. For over 50 years, DF Goldsmith has built a reputation as a valued supplier of high-purity chemical and precious metal based products. Our clients include R&D laboratories, the electronics and healthcare industries, research universities, and many others. With a specific emphasis on precious metals, DF Goldsmith supplies a wide range of products, in addition to custom and toll-based manufacturing. DF Goldsmith can service customers who don’t need production quantities, but may require special financing or pricing arrangements. Though the product listing on our site is quite extensive, with many items available for prompt shipment, don’t feel limited to the items shown. Please request a quote for any product that you don’t find listed, but may be required for your unique application.